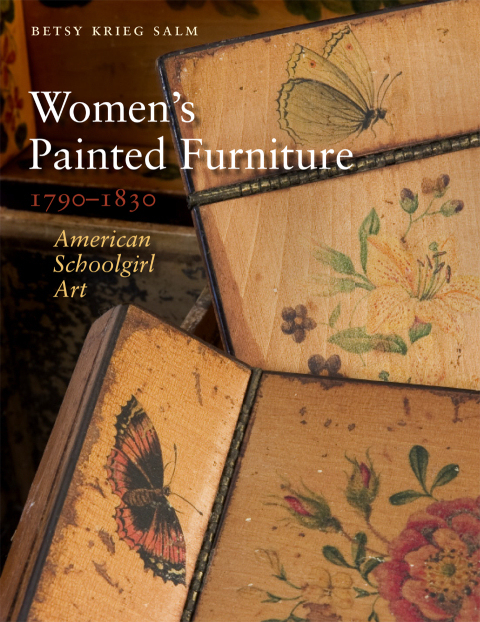 I was researching a post on painted “fancy chairs” from the Federal era and after when I got distracted by a great book and its subject matter: Betsy Krieg Salm’s Women’s Painted Furniture, 1790-1830 (University Press of New England, 2010) caught my eye in the library for numerous reasons (it’s a beautiful book, I love painted furniture, the era coincides with Salem’s golden age, so I knew I’d find some good stuff in it), but once I opened it I could not put it down. The result of three decades of research by the author (who is an ornamental artist herself), the book is art history, social history, education history, cultural history, world history all at the same time. Work Box by Ann Trask, Rowson Academy, Boston, circa 1810-20. Collection of Old Sturbridge Village. 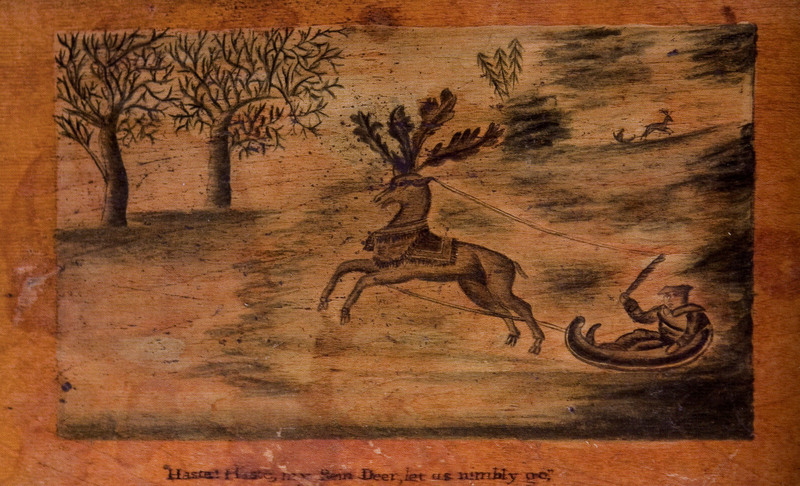 Lid of Work Box by Hannah Bland, Massachusetts, circa 1810-30. Private Collection. 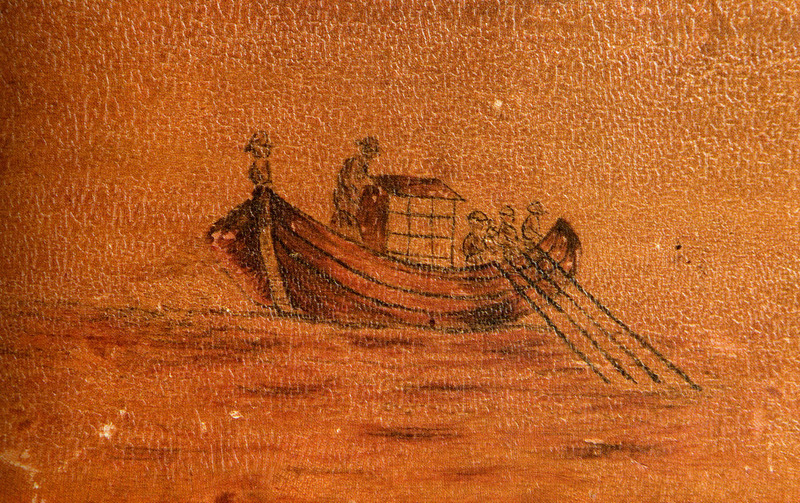 Detail of Lobstermen from Work Box of Fanny Barber, Gloucester, Massachusetts, 1821. Private Collection. These boxes are so charming and so reflective of the environments in which these girls lived and worked, as well as the more general cultural influences to which they were exposed. A little bit more context, for both American schoolgirl art and (transatlantic) work boxes in the first half of the nineteenth century: a concise yet substantive article about the curriculum and culture at the Misses’ Martin’s School in Portland, Maine, and a few images of professionally-made work boxes from the British Empire. 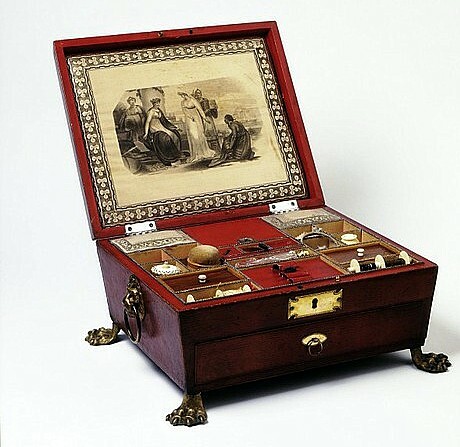 The first box is a particularly expensive example, with leather covering, silk lining, brass fittings, and custom-made sewing and needlework accessories, from the collection of the Victoria & Albert Museum in London. Work Box, England, circa 1815. Collection of the Victoria & Albert Museum, London. 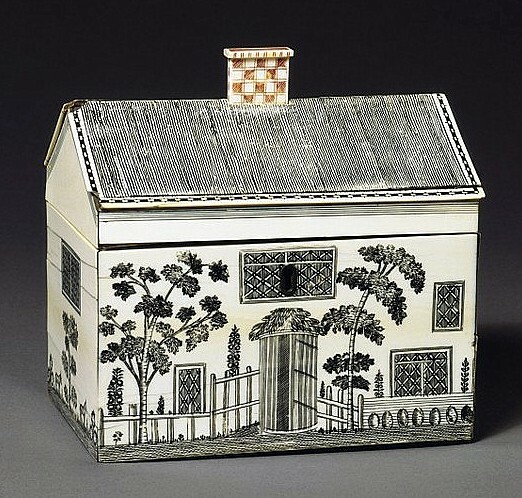 These last two “cottage” work boxes are both examples of Tunbridge ware, even though they were made in places thousands of miles apart: southeast England and India. Tunbridge ware is the very intricate type of inlaid woodwork that emerged in the vicinity of Tunbridge Wells, Kent in the eighteenth century, characterized by the creation of mosaic patterns with different colored woods, and sometimes other materials. 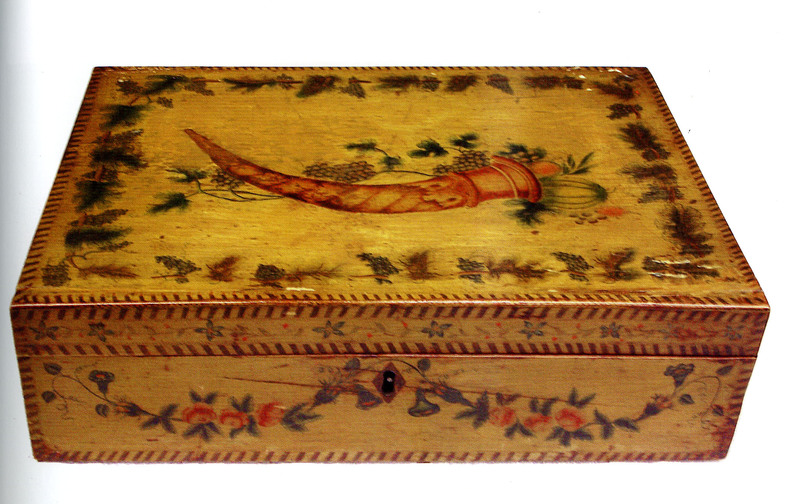 Tunbridge ware designs influenced American decoration and obviously Asian as well, as the second work box, made of wood veneered with ivory, was made in India around 1790-1800. Tunbridge ware painted sewing box, early 19th century, Bleasdales Ltd.
Ivory-veneered Work Box, Vishakhapatnam, India, circa 1790-1800. Collection of the Victoria & Albert Museum, London. This entry was posted on Friday, March 9th, 2012 at 10:36 am	and tagged with Antiques, books, England, Interior design, Maine, Massachusetts, Peabody Essex Museum, Victoria & Albert Museum and posted in History. You can follow any responses to this entry through the RSS 2.0 feed. Coming from Utah, I have a little to say about Mormon culture. I recently came across some books and pamphlets in an antique store. The literature consisted of books from the early 1900s until about the 50s talking about how young girls in the church were supposed to behave in society. We definitely don’t have books of that caliber today, be we do have “Young Women in Excellence” awards in which teenage girls receive recognition for completing a book of guidelines or something. I’m more familiar with the “Duty to God” award for men, which is also an interesting facet of Mormon culture. Anyway, the early days of the Mormon church are filled with this “schoolgirl art” as you’ve called it in your post. How interesting, Ryan. Thanks so much–I am very interested in this concept of schoolgirl art as it developed in other cultures and times. Charming and I need to go seek out your example from the PEM. Reiterating what was said above, but great post. Thanks Susanna; I need to go find that Salem box as well. Sheraton fancy chairs, you say? My favorite. Thank you for you enthusiastic response to my book, Women’s Painted Furniture”. Makes me realize it was appreciated. Back to the studio.